Designed and built in the UK by JoeCo, one of professional audio’s most trusted brands, Cello allows you to experience the world-renowned build quality and exceptional sound long relied upon by the world’s biggest music tours and TV shows. With its true analogue front end and tactile control surface, Cello is a 22 input, 4 output USB 2.0 interface for Mac and PC created to bring the classic era of electronics straight to your studio. Even better, with 125dB dynamic range and operation up to 384k, great design has never sounded so good. Cello offers an irresistible invitation to take advantage of one of the audio industry’s most advanced feature sets. The cutting-edge specification includes a carefully curated selection of dedicated effects for Cello‘s new preamp design, developed in-house by JoeCo. Adaptive Conversion technology, offering new ADC and DAC filtering options, enables users to tailor the performance of their Cello depending on their choice of sample rate and the source they are recording. The exclusive Top+ algorithm provides high-end sparkle for added energy and expanse. In addition, JoeCo’s already world-famous clocking algorithms have been rewritten especially for Cello. Also included are a built-in talkback microphone and monitor controls. At the front end, the two microphone inputs include discrete analogue mic preamps with 80 dB gain, Hi-pass filter, Pad and Phase Reverse, with two dedicated preamp-only channels to ensure signal purity. Inserts points are incorporated in both mic channels for outboard equipment. S/PDIF and 16 channels of Adat Lightpipe input are provided for use with external preamps. Mastering grade monitor outputs ensure the best results, while the unit can also accept external wordclock. All of this comes in a compact interface that sets a new standard in digital conversion clarity and sonic imaging. With sharp stereo and unequalled transient accuracy, Cello can handle the demands of high-end sound design with ease, blending authentic analogue warmth blended with the crisp precision of one of the world’s most powerful recording devices. 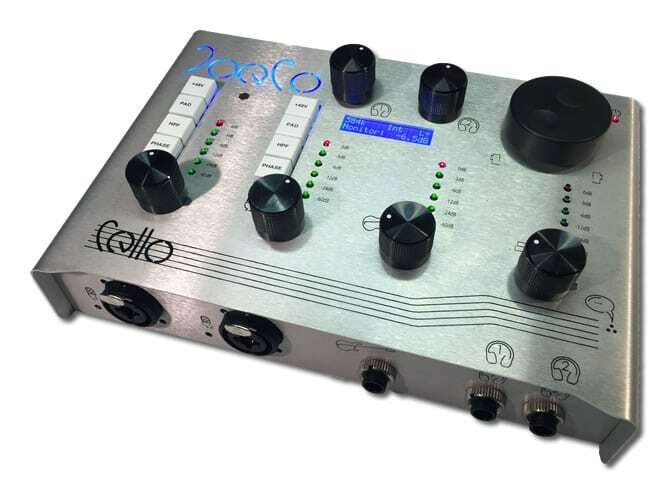 Want to find out more about the JoeCo Cello Audio Interface?